I offer quality spinning wheels, fine spinning fibers, hand and commercial spun yarns, books, knitting needles, crochet hooks and more! 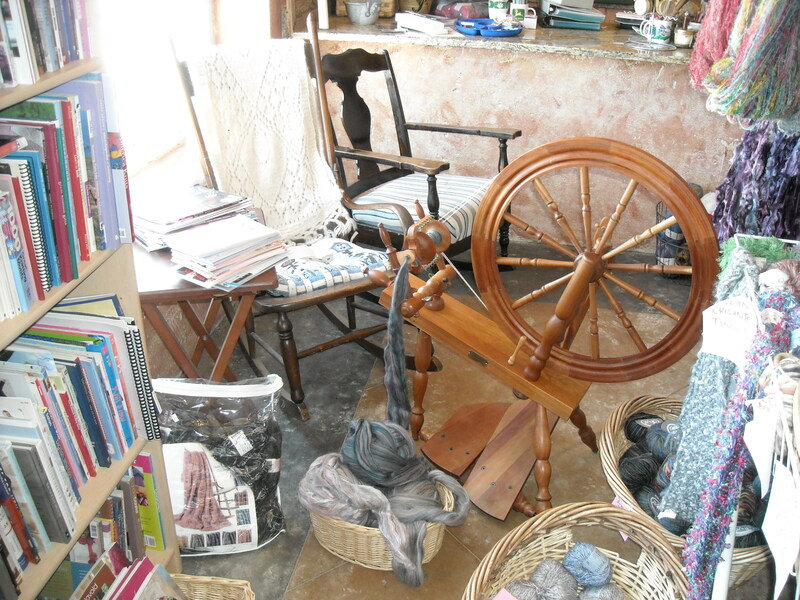 My love of spinning started when I found an old spinning wheel in my husband’s attic. We had just gotten married and I was attempting to consolidate two households. I found it in the midst of deciding what to toss and what to keep. That wheel and I became instant friends. Since I had been deprived of knitting with good wool yarns for so many years, my addiction and that old spinning wheel made an instant connection. I found a spinning wheel dealer in my area willing to help me revive the old wheel. Equipped with one lesson, a new drive band, and a bag of wool, I started. Unfortunately, this poor old wheel just did not want to cooperate. In desperation, I tried a new wheel belonging to a friend of mind. I needed to find out if I was untalented or if it was my sweet little old wheel that had seen better times. I was pleasantly surprised when I instantly managed to make a passable yarn. This started my love for spinning and anything and everything involved with it. In 1995, I bought my first Angora bunny and a new S-51 Louet wheel. I learned to spin on Angora fiber. I took classes every year at the Rendezvous in Bemidji, MN with instructors such as Celia Quinn, Carol Rhodes, Patsy Zawistoski and Judith MacKenzie McCuin. My bunnies won many awards, and in 1999, I added sheep to my fiber herd. I now have one of the best fleeced spinning flocks. My spinning flock contains Icelandics, Wensleydales, various crosses and my new addition of Blue Faced Leicester. In the past years, I have taught beginning spinning classes, advanced spinning classes, spindle spinning, knitting and crochet classes at Shepherd’s Harvest and the Mora Sheep and Wool Festival and Federation. In addition to teaching at these well-known festivals, I have also taught beginning spinning, and knitting through local Community Education. In connection with local guilds, I have performed many demonstrations at local fairs and re-enactments. As the business director for two years for the Minnesota Prairie Spinners guild, I organized three annual retreats. I am now retired from this position. Spinning and knitting is my passion. I have spun and knit many fibers and have tried to perfect my abilities and knowledge through education and practice. In addition to the classes that I have taken, I have spun many different breeds of sheep, yak, camel, mohair, angora, musk ox, llama, alpaca, silk, cotton, ingeo, soy silk and many other fibres in a variety of preperations. Currently I am expermenting with different dying methods and hope to expand to natural dyes this summer as all the different plants used grow and mature. My shop’s name is Yesterday’s Crafts, where I offer a large variety of yarns and spinning supplies as well as classes. I am always willing to offer my expertise and instruction for free or for a minimal fee. Interested in a spinning wheel for a beginner. Do you have anything that might work? Thanks. I have several wheels in stock. Let me know if you would like to come and look at them.